Roam France offers the perfect location for team and club training camps or bespoke cycling tours. Based in the quaint, unspoiled spa village of Rennes les Bains, nestled between the flat coastal plains of the Mediterranean and the spectacular Pyrénées Mountains, the undulating terrain provides some of the best cycling in Europe. If you require a structured training camp, or a guided tour, Roam France can set up your personalized trip. With mechanical support, housing/hotels, as well as airport transfers and meals, we can offer you a stress-free trip in one of the world's most famous cycling regions. Rennes le Château, perched on a hill overlooking the Aude valley, attracts thousands of international visitors every year. This little village is the center of various conspiracy theories and was featured in the Da Vinci Code movie. It's the perfect arrival day spin to the top to grab a coffee, enjoy the view and to prepare you for the week to come. Spectacular views of the Aude valley. 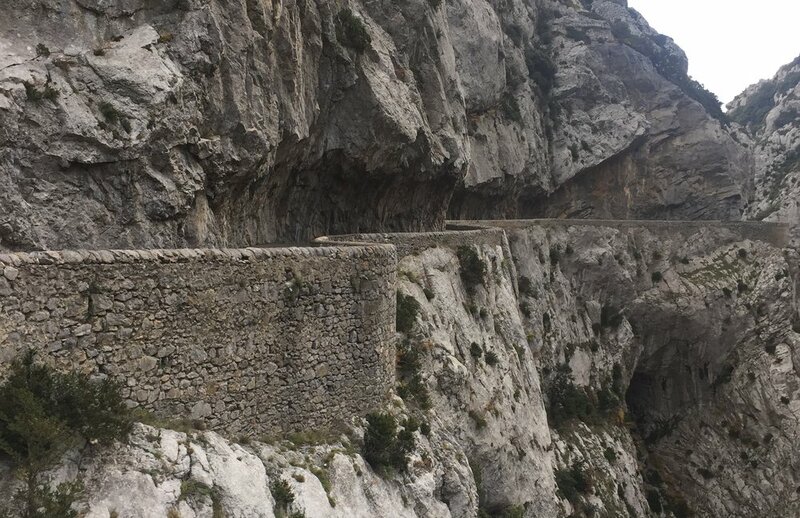 There are over 11,000 castles in France and this route takes you past 10 of them, including Peyrepertuse and Quéribus, two famous Cathar castles in the Languedoc. This route features a stop at one of our favorite cookie shops if you fancy a mid-ride snack. Gorges de Galamus, one of the most famous balcony roads in France, is a breath-taking ride along spectacular limestone cliffs. Photos don't capture the incredibly narrow, twisting roads, the stunning views or the imposing depth of the ravine. This route is a favorite among both visitors and locals alike. Let's get this conversation started! Tell us what dates and what kind of tour/camp you are interested in, and we'll go from there. The roads in the Languedoc Region are quiet, scenic and well-maintained. Like Gravel? So do we. Ask about our Gravel Tours!